What Time Is Your Instagram Audience Online?Working out when is the best time to post your content is one of the most important factors that you go through when creating an effective social strategy. You have to be able to target your followers at prime times to ensure that your messages aren't being lost in the feed. Would you recommend Prime for Instagram to a friend? Chawee Moyle has used this product for one month. @byjacksolomon My understanding is that any of the methods currently used to schedule posts for later are against the instagram API terms and conditions... how have you overcome that? @rossdcurrie @byjacksolomon I'm also very curious about this. @rossdcurrie We send you a notification at the time for which you scheduled a post, and that opens Instagram with your photo. All you have to do is paste in the caption and press "Post"! We have gone through all of Instagram's new review processes, and been 100% approved. Scheduling is impossible to automate with Instagram at the moment - so this is the closest we could get. Would love to hear your thoughts on the app if you get a chance to download it (it's free at the moment). @raudaschl see my full response below (to @rossdcurrie). Pretty much, it's not entirely automated, it has to send you a notification which you have to manually open in order to post to Instagram. Otherwise, though, Prime has been (after a lot of effort) fully approved by Insta! @byjacksolomon @raudaschl Oh, that's really not post scheduling then. That's post reminding. 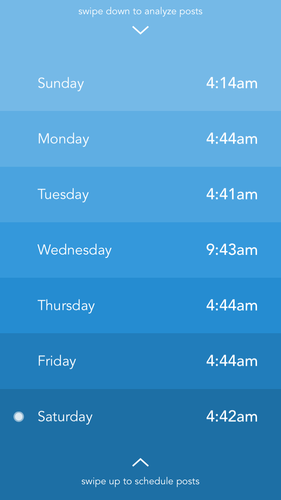 Being a fellow Aussie, I'm sure you can appreciate that the #1 reason I need post scheduling is because my biggest audience is awake while I'm asleep. The last thing I want is a notification popping up at 4am telling me I need to post on instagram. This is a feature that most of the scheduling companies are using in lieu of actual scheduling capability within Instagram and honestly, it ticks a box but it doesn't offer me any value.. Personally I'd be more interested in using your app long-term if it had more analytical data for me to consume. I quite like the idea, and the organic interface. You guys should probably put a lot of effort into marketing this for top-Instagramers, since they'd be most interested in the product. Would love to see this being used more – Growth Hacking for Instagram. @oskar Yep - exactly! We're in contact with a lot of big Instagrammers (including a number of celebrities with verified Insta accounts), and are growing pretty quickly at the moment. By the way, if you have any feedback on the app itself, I'd love to hear it. @byjacksolomon No problem. I would also like to add this is really a "must have" for any Instagram user as it optimizes response for their postings! Cheers! The onboarding experience is a bit frustrating.. the app got stuck on Step 2 for a lot more than 30 minutes, and in the meantime if I closed and re-opened the app it wouldn't go past the splash screen. Would be nice if it brought me into the app and gave me some sort of preview of features, or a status bar indicator at the top to let me know something is happening. Perhaps an explanation of what it's doing at each stage, or a series of tasks it can check off. The calculation of the optimal posting time seems to be based solely on engagement - I get the most likes/comments at a certain time, so the app assumes that's the best time for me to post. Is that really the best time for me to post? For example, I tend to post photos late at night (Australia time), which means they hit US early morning commuters, and slowly get likes/comments over the day so that by the US afternoon, my photos are now in the "top posts" for the hashtags I use. Meanwhile, if I were to post my photos at the time they were getting the most engagement, I feel like the "top posts" event would occur while the US audience is asleep. I'd feel a bit better if it showed me that it was somehow taking historical post data into account as well. @byjacksolomon Hah, maybe I'll give it a shot on Wednesday The secondary suggestions are definitely a bit more reasonable.